Giving credit where credit is due, I saw this recipe over at Eats Well with Others, and made it that same evening. I did not have pomegranate seeds at the time, so I used diced mango as a sweet component. We loved it so much I made it again a few days later, this time pomegranate seeds were involved, and I can tell they are a must here. 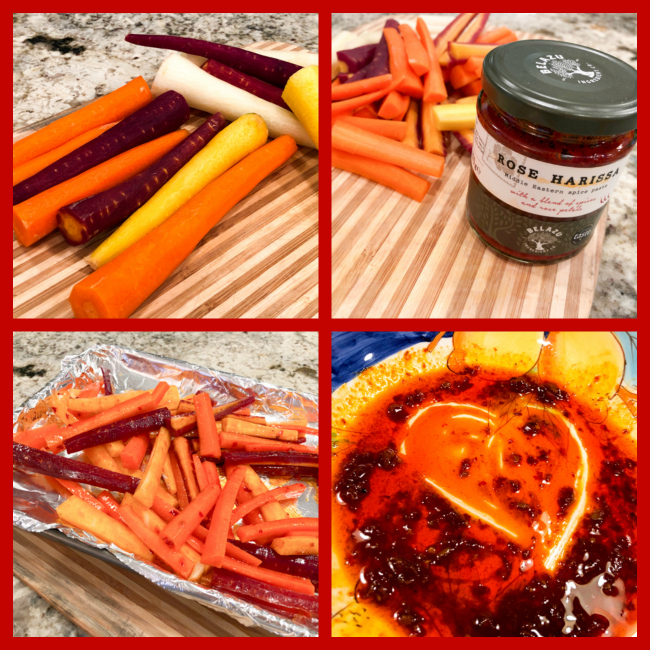 Because I used rainbow carrots, there was not that much contrast of color, but their tiny bursts of sharpness and fresh flavor contribute a lot to the sweetness of the carrots. This will certainly be a regular appearance in our meals, at least for as long as I can get my hands on the amazing ingredient that is rose harissa. Thank you, Joanne! Peel the carrots and cut into batons. In a large bowl, mix together the olive oil, harissa, cumin, pomegranate molasses, and salt. Add the carrots to the bowl and toss well to combine. Spread on a parchment-lined baking sheet and roast for 20 minutes, or until starting to caramelize and become tender. 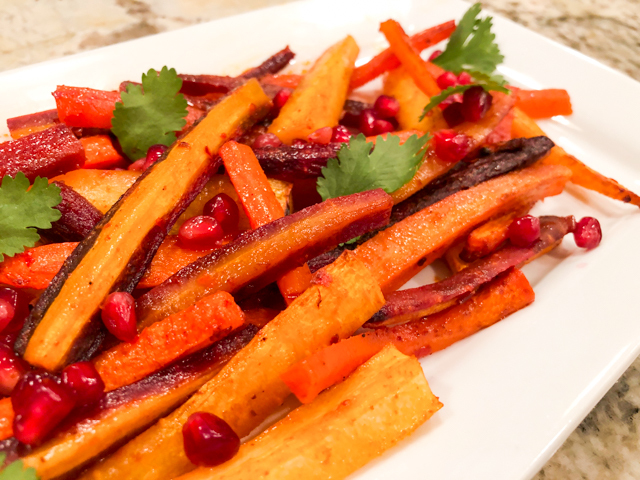 Remove from the oven, add some lemon juice and sprinkle with pomegranate seeds. Decorate with cilantro leaves, if so desired. Comments: I am absolutely in love with this dish. I had to wait a long time to get rose harissa, since it was shipped all the way from England, so I get very protective of my bottle and always wonder if I should really use it in this or that preparation. Well, this one is definitely worth getting that couple of tablespoons from My Precioussssss. My love for this sauce should be quite clear from the composite photo above… It is not really hot, it’s intense and complex, with a very subtle floral component from the rose. The more I use it, the more I love it. Which means soon it might be time to cave and place another order for it. Either that or emigrate to UK. NINE YEARS AGO: Paris, je t’aime! 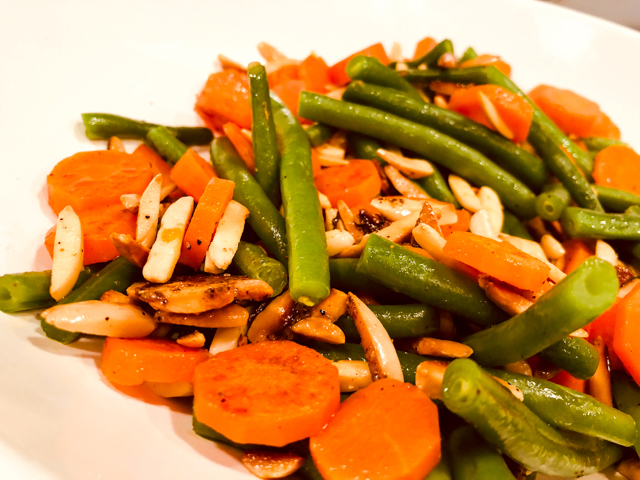 Green beans with almonds is such a simple recipe. A bit like avocado toast: grab bread, toast it, smash avocado on it, top with whatever you like, give it a fancy name and be done with it. Yet, here I am to share an almost non-recipe with you. It turns out that this was unexpectedly delicious. And I will be making it again and again. That makes it blog-worthy in my book. So there! To make the almonds: In a small bowl, combine the sugar, chili powder, za’tar, salt, and cayenne. Heat the olive oil in a small nonstick skillet. Add the almonds and cook, stirring occasionally, until they are beginning to brown, about 2 minutes. Sprinkle them with the sugar-spice mixture and stir almost constantly until the spices are fragrant, do not let it burn. Move them to a plate and reserve at room temperature. Bring a medium saucepan of salted water to a boil over high heat. 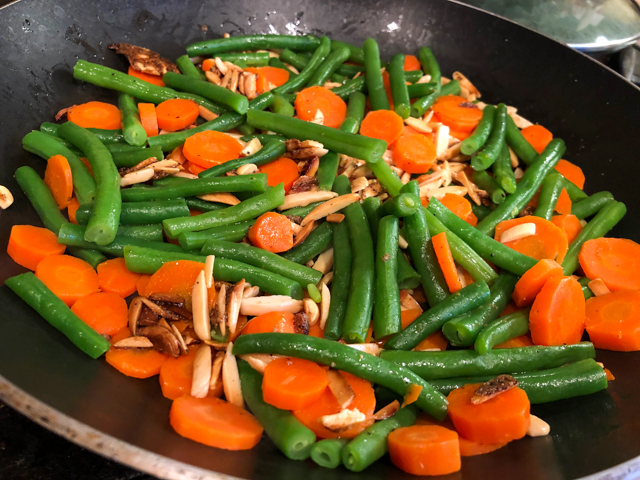 You have two options: add the green beans and carrots and cook both together until crisp-tender, about 4 minutes. 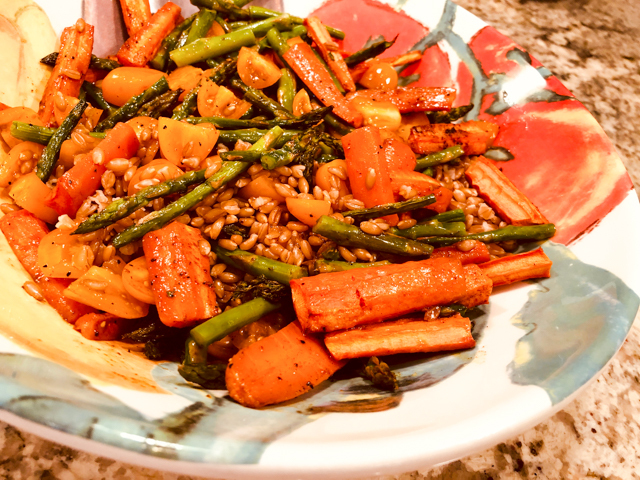 Or if you prefer the carrots a bit more tender, add them first, cook them for about 3 minutes, then add the green beans for additional 4 minutes of cooking. Drain both veggies well, lay over paper towels or a kitchen towel to remove all excess water. Finish the preparation: Add the olive oil to the a non-stick skillet and heat over medium-heat. Add the green beans and carrots and toss well. Sautee until you get some color on some of the green beans and carrots, the less you move them around the more they will brown. Season with salt, add the almond mixture, toss just a couple of times to spread them around the veggies. Transfer to a serving dish. Comments: Two game changers here, the inclusion of carrots and the sweet-and-spicy mix. 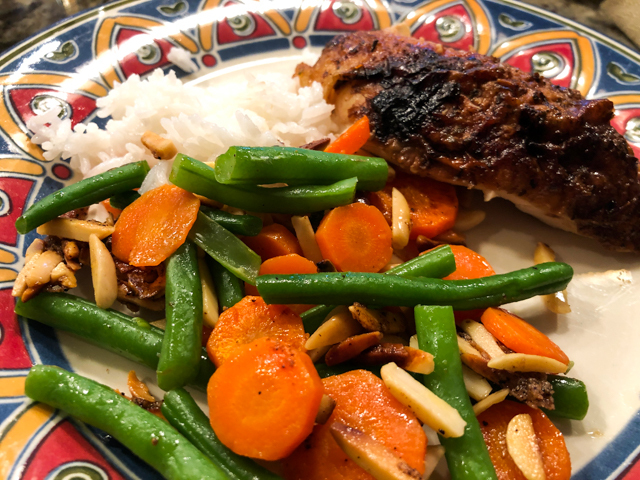 We have green beans with almonds very often, but this preparation feels like a totally different recipe, with the carrots bringing a nice contrast of color, and the spice mixture giving just the right amount of naughtiness to the almonds. Simple, no doubt, but so delicious. Cumin could be a nice addition, although I do feel that it tends to overpower things a bit. You should come up with your own version of spices just keep the sugar and use your imagination. Keep in mind that nothing brightens up this type of dish more than a little squirt of lemon juice in the end, right before serving. I totally forgot about it. Leftovers were great next day, but probably a lot better if someone had not picked all the almonds as a post-dinner snack. Confession: I did it. They were that tasty. I am sorry. Kind of. Dinner is served! Store-bought rotisserie chicken, a bit of rice and this tasty side dish. Easy to bring to the table even after traveling the whole day. 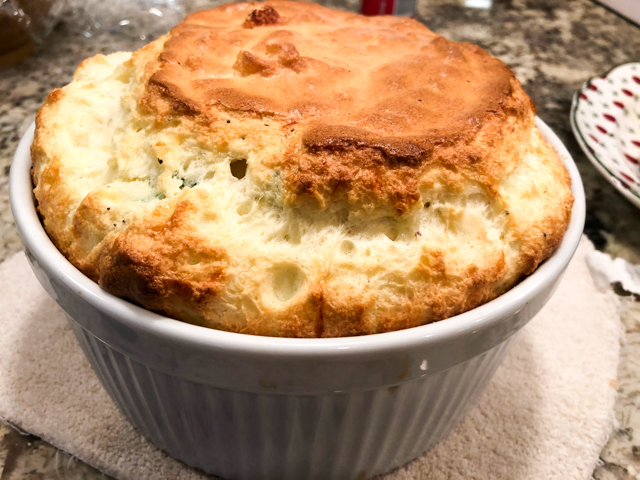 Some recipes can be intimidating, and soufflé is definitely part of the group. But honestly, it is very easy and flexible, in the sense that you can add pretty much anything you want to the basic formula. Plus, even if it does not rise as high as you would like, it’s always delicious. I guess the only way to really ruin a souffle is baking it to the point it dries out, but to get there the surface would be so dark, it would act as a warning sign. Of course, I suppose one could forget it in the oven. But, I digress. This version is a variation of my default recipe from Julia Child, a recipe that never let me down. 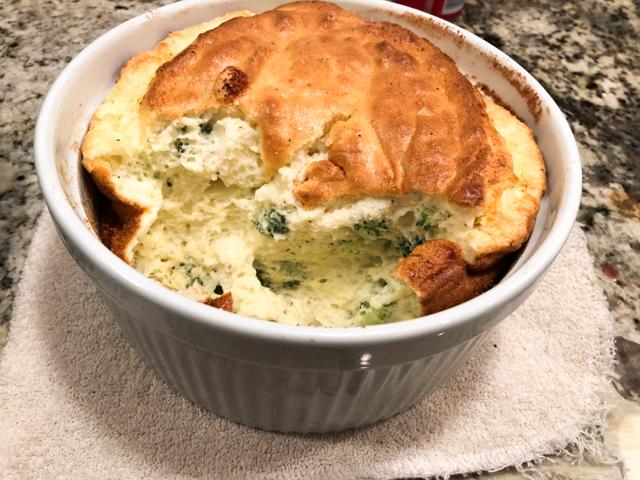 Broccoli makes the egg mixture slightly more dense, so it won’t rise as much as a souffle prepared exclusively with cheese. But I will share a couple of tricks to maximize lift under the circumstances. Read on. Before you start, cook the broccoli florets. Place in a microwave-safe dish, season lightly with salt, and sprinkle some water. Cover with plastic wrap and microwave for 2 minutes. Immediately remove from the dish and lay on a plate to cool. Cut in pieces that are no more than 3/4 inch big. Reserve. Beat the egg whites with a pinch of salt until firm peaks form – depending on your mixer or the strength of your biceps it will take 2 to 5 minutes. Add 1/3 of this mixture to the sauce, to thin it slightly – add the cheese and mix well. Now, add the remaining egg whites and fold into the sauce. You don’t need to mix it until it is all incorporated and totally homogeneous, because the “lift” of your souffle’ depends on the air present in the beaten egg whites. When it’s almost fully folded, add the broccoli florets and fold a few times, very gently. Serve right away, souffle waits for no one! Comments: The best way to maximize lift when using a heavy vegetable such as broccoli, is to cut it in smallish pieces and add them to the base when you are almost ready to pour it into the baking dish. Some recipes will ask you to process the veggies, but I much prefer slightly larger pieces. For that very reason, blanching, steaming (or cheating and using the microwave) is also recommended. I’ve made the exact same recipe using raw broccoli and prefer it this way. 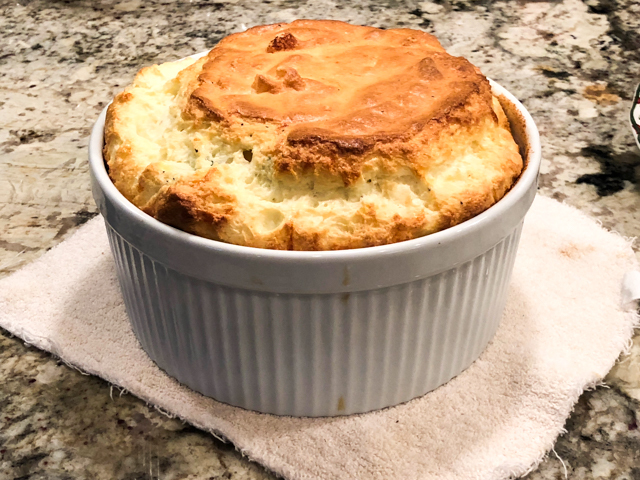 Here’s free advice for my readers: if you are the partner or family member of a food blogger, get out-of-the-way once the souffle is served. Yes, you will be eating it soon, but picture obviously trumps appetite. Obviously. 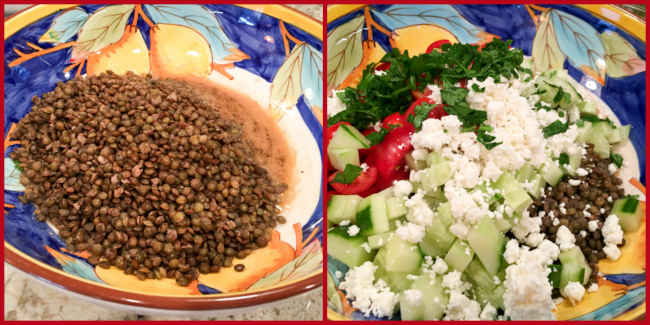 LEBANESE LENTIL SALAD AND A COOKBOOK REVIEW! Not too long ago I reviewed a cookbook by a fellow member of The Secret Recipe Club, remember? 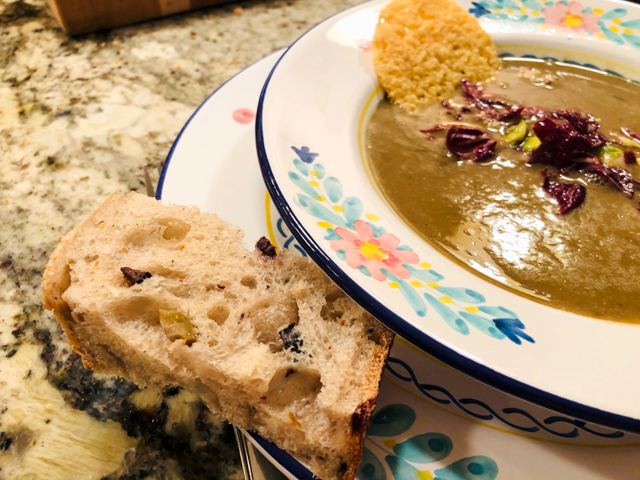 Well, here I am once again to share with you a recipe and a little overview of the beautiful cookbook just published by my friend Susan, Simply Vegetarian Cookbook. She is also a former-secreter, someone I used to have a ton of fun with “behind the curtains.” Good times, good times indeed! I miss those days, although we are still in touch through our blogs and Facebook. I actually prepared two recipes to feature, so I tossed a coin (literally) to pick this one. The second will go as I often do, as a teaser. No recipe, just a photo. I’ve been called a teaser more than once in my lifetime. There are worse adjectives out there, so I accept the label with a smile. Bring the broth (or water) to a boil in a medium pot. Add the lentils and ½ teaspoon of salt. Reduce the heat to a simmer, cover, and simmer for 15 to 20 minutes, or until the lentils are tender and the liquid is absorbed. If there is any liquid remaining, drain it. In a large bowl, whisk together the sherry vinegar and Dijon mustard. Whisk in the olive oil until emulsified. 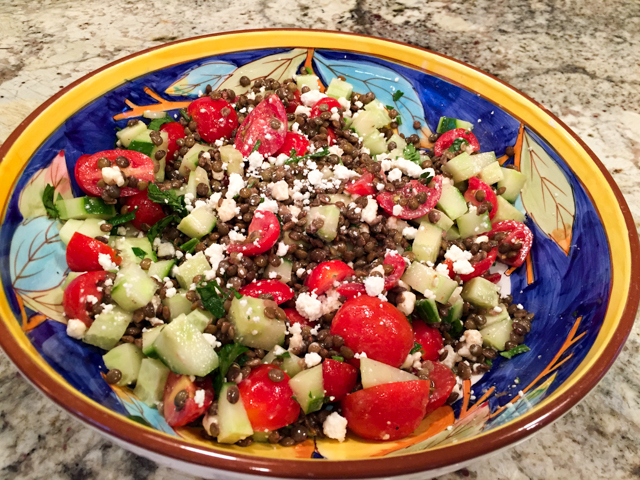 Add the cooked lentils, cucumber, tomatoes, feta cheese, and mint, and toss to coat. Season to taste with the remaining ½ teaspoon of salt and the pepper. Comments: There are many types of lentils out there. For this particular recipe (and in fact, anytime you want to make a lentil salad), it is worth searching for French green lentils (such as Puy). They hold their shape after cooking, which is what you want in a salad, nothing worse than a mushy grain mixed with crunchy veggies and dressing. I love Susan’s approach of making the dressing right in the bowl you will serve the dish, one less item to wash. I normally do that even with leafy salads. I just don’t mix everything in advance. Place the more sturdy leaves (like Romaine lettuce) at the bottom, add the other components and toss them all when we are ready to eat. I served this colorful and flavorful salad with grilled pork tenderloin on day one. 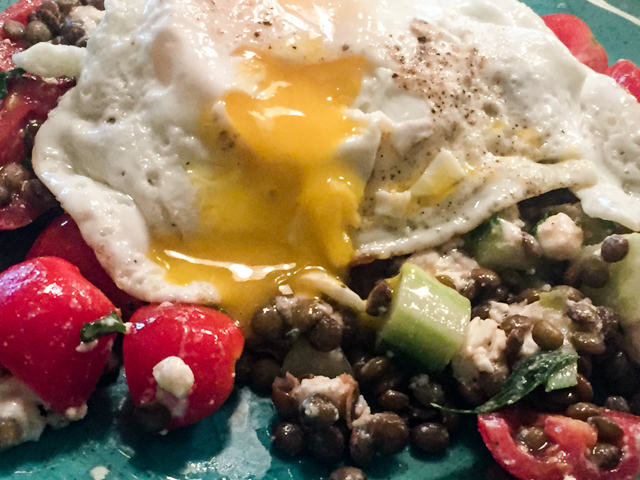 Next day leftovers were amazing for lunch, re-visited with the highly fashionable fried egg (I know, many are tired of the fried egg omnipresence, but I happen to love it). And now it’s time for a virtual tour of Susan’s book… come with me! The book is organized in a very clever, non-traditional way. Chapters are organized by method of cooking instead of course, or type of food. 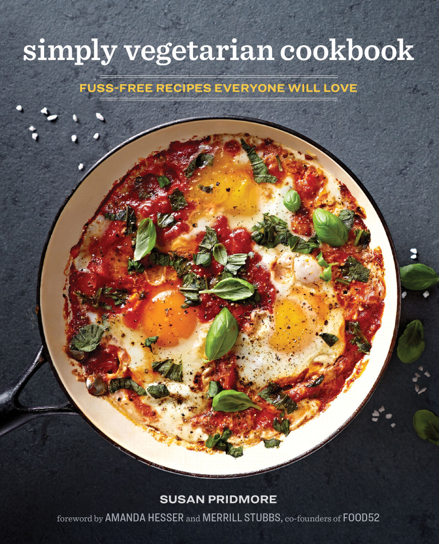 CHAPTER ONE: Meatless Made Easy, is a great write-up on what to consider if you’d like to either become fully vegetarian or reduce the overall intake of meat in your diet. Susan cooks and eats mostly vegetarian dishes, but her husband is a full-blown carnivore, so she includes in her recipes little final tips she calls “flexitarian tips.” How the same recipe could be served or made to include some animal protein. Pretty clever, and definitely expands the usefulness of the book. I am a full-blown omnivore, and appreciate that aspect of the book. As I like to do in my reviews, I will pick 2 or 3 top favorite recipes from each chapter, so you can get an idea of what it’s all about. CHAPTER TWO: NO COOK RECIPES. Tough to pick just a couple of examples. She starts with smoothies, all pretty tempting. But I think the ones that truly called my name are Mediterranean Wrap with Spicy Chickpeas (I cannot have enough chickpea recipes), White Bean Wrap with Jalapeno-Apple Slaw, and her beautiful Lemony Romaine and Avocado Salad (I actually made a departure on it). CHAPTER THREE: THIRTY MINUTES MAX. Who does not love that type of recipe, when we work all day and come home starving? From this chapter comes the featured recipe, Lebanese Lentil Salad, which is a winner all the way! 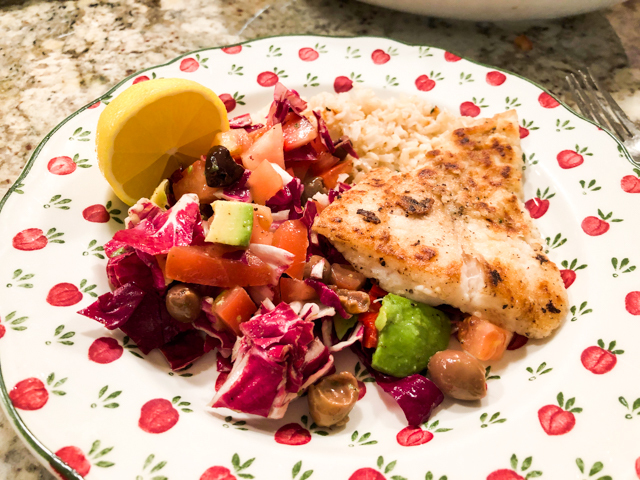 But I had my eyes set on Middle Eastern Cauliflower Steaks, and Smashed Chickpeas and Kalamata Pasta (I considered making it with zoodles for a low-carb version full of flavor). CHAPTER FOUR: FIVE INGREDIENTS. Another non-fuss chapter, which makes her book so appealing, you just know it will be an easy culinary project to get the meal ready. My favorites: Baked Sweet Potato Latkes (I know you just drooled), Delicata Squash and Black Bean Quesadillas (my favorite squash that I should bring home more often), Caprese Avocado Grilled Pitas (talk about creativity!). CHAPTER FIVE: ONE-POT AND SKILLET. I went crazy for the recipes in this chapter, truly difficult to select just a few. I loved the idea of her Spicy Skillet Eggs, Cilantro-Lime Cauliflower Rice, and Crispy Black Bean Burgers. Just to share a few. CHAPTER SIX: SHEET PAN AND BAKING DISH. Chapter opens with a huge contender, I almost made it to feature today: Kofta-Style Chickpea “Meatball” Pitas. Curried Cauliflower Tetrazzini, and Baked Cheesy Broccoli with Quinoa make my top list too. CHAPTER SEVEN: SLOW-COOKER and PRESSURE COOKER. Well, those are dear to my heart. I love using both cooking gadgets, and have a huge collection of recipes waiting to be made. My top choices from this chapter include: Tomato-Mushroom Ragu, Butternut Squash and Barley Risotto (these two are made in a slow-cooker). For the pressure cooker, I will go with Chickpea and Coconut-Curry Soup and Tomato Biryani. CHAPTER EIGHT: KITCHEN STAPLES. Now that’s an interesting chapter. I confess that in every single cookbook that includes this type of chapter, I don’t look twice. I am never that interested in making a bunch of sauces or dressings and saving them in the fridge. Just not my style of cooking. What ends up happening is that I forget all about them and next thing I know, they get moldy, and into the trash they go. Now that I confessed my capital sin, let me say that I was pleasantly surprised by my reaction to Susan’s Kitchen Staples. Lemony Breadcrumbs, Miso Butter, Smooth and Creamy Hummus, Tahini Miso Dressing? I want them all… Go figure. She ends the book with a big reference guide to cooking all things veggie. Quite useful if you are considering venturing more and more into this type of nutrition. A very comprehensive list, with all the details for optimal preparation. Before I leave you, let me offer the teaser recipe. This was soooo delicious! 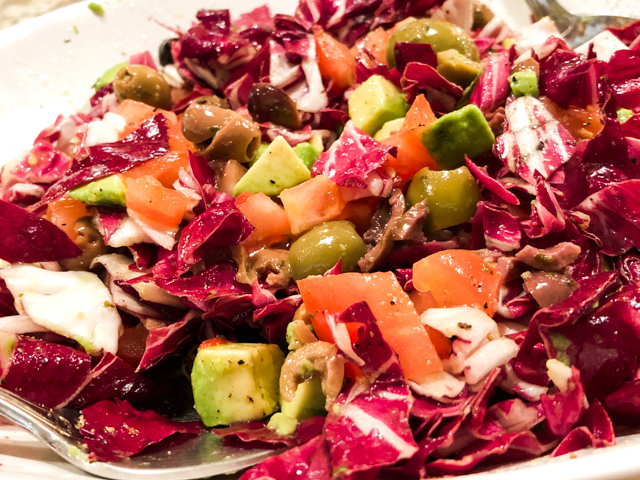 Another colorful salad, a Lebanese Chopped Salad (from Chapter Two) with torn pita bread. The dressing involves buttermilk… I say no more. Amazing! You need the book, and you know it (wink, wink). 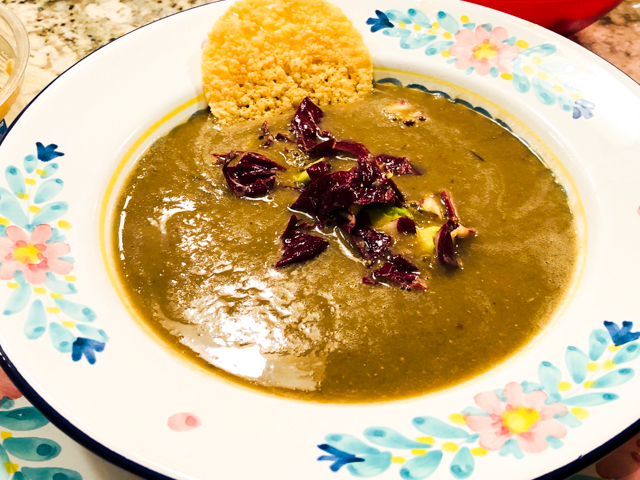 Susan, thanks for allowing me to publish one recipe from your beautiful book, and I wish you the best of luck with it… I can imagine the amount of work involved from the conception to the publishing of a cookbook, so congratulations are in order! 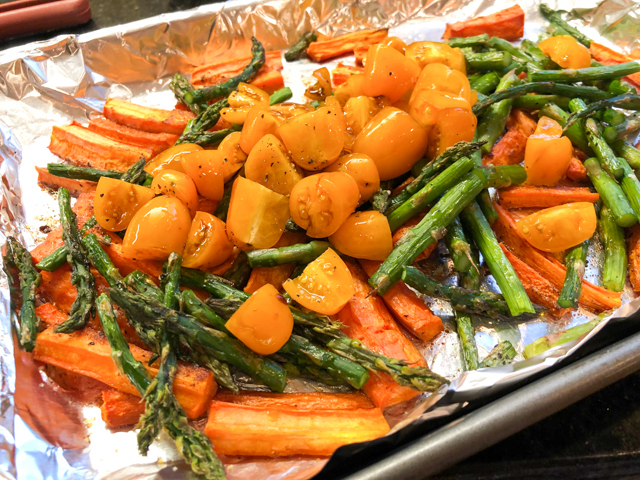 Recipes for roasted veggies are always so similar, coat veggies with olive oil, season any way you particularly like, roast. Done. But this one has a little unexpected (to me) twist. Instead of olive oil, you’ll use butter. I know, so out of fashion, so frowned upon by the Health Police. This method was featured on a recent America’s Test Kitchen TV show, and I was obviously intrigued. I modified it a bit to our taste. The butter helps that gorgeous browning and adds a nutty flavor that goes well with the cashews. It all works beautifully. 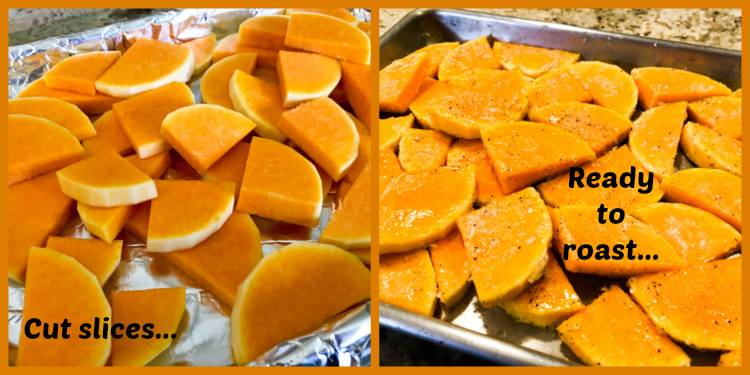 Toss squash slices with melted butter, season with salt and paprika until evenly coated. Arrange seasoned slices on a rimmed baking sheet, if possible in a single layer, but some overlapping is ok. Roast for about 25 minutes, flip pieces and roast 15 minutes longer. While squash roasts, melt butter with cashew nuts in a small skillet. Cook until cashews start to get golden, keep a close eye on the pan. It will burn if you leave it cooking for longer than a couple of minutes. Remove skillet from heat and stir lemon juice. Season lightly with salt and pepper. 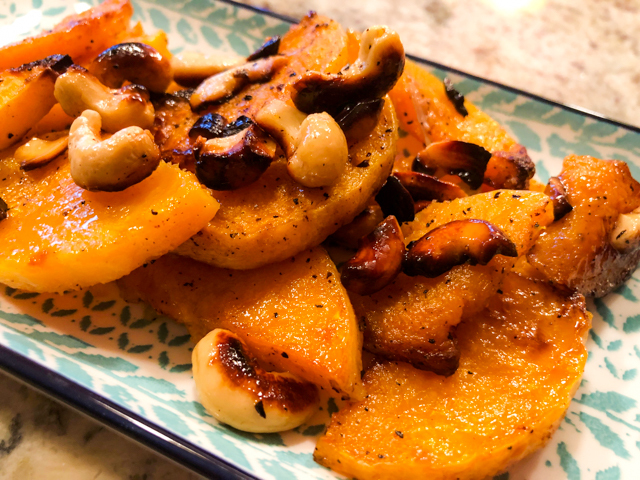 Transfer roasted squash to a serving dish, mix with the sautéed cashews and serve. 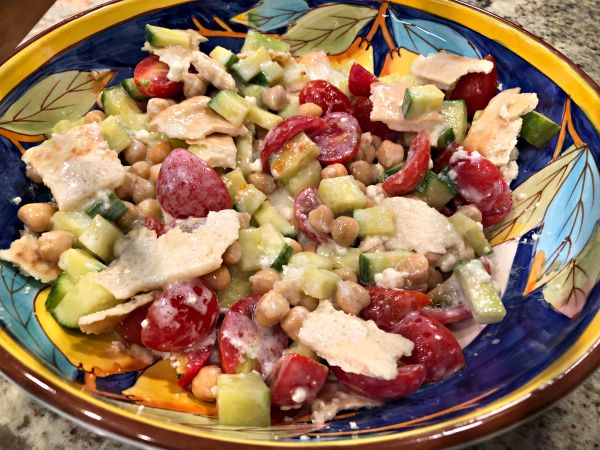 Comments: I talked about this recipe on my Facebook page, and a dear friend mentioned that she had a similar dish at a restaurant and loved it, but in that preparation they included crumbled feta on top. I know exactly how I’ll make it next time, and urge you to do so if you make it yourself. Sounds perfect to me. The butter definitely makes the roast butternut quite special, as it cooks in the oven it gets that “browned butter” quality that is so wonderful both in savory and sweet dishes. I know many people are anti-butter these days, but there’s nothing wrong with using it every once in a while in a dish like this one. Totally worth it. THREE YEARS AGO: A Star is Born!